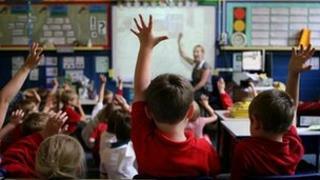 All state schools in England will be able to decide their own term dates, under plans for more school autonomy announced by the government. This will extend a flexibility that is already available to academies. It could mean that more state schools switch from the long six week summer holidays. The Department for Education said terms should be decided by "heads and teachers who know their parents and pupils best". Head teachers warned that parents with children in different schools would still expect local schools to agree common dates so that families could plan holidays together. Schools can already vary the shape of the school day, but from September 2015 they will also be able to change the length of their terms. Labour's education spokesman Stephen Twigg announced last month that a future Labour government would extend these academy flexibilities to all state schools. It means that both the coalition government and opposition are pushing for greater powers to be devolved to individual schools. A majority of secondary schools are now academies, but most primary schools have not adopted academy status - so this would represent an extra level of flexibility for them. They would still have to operate within a legal limit of a minimum of 190 school days each year. The Department for Education gave examples of how this might be applied. In Leeds, the David Young Community Academy has a year of seven shorter terms and holidays that are not longer than four weeks. The Boulevard Academy in Hull is going to cut the summer holiday from six weeks to four weeks. "It is right that all schools are free to set their own term dates in the interests of parents and pupils," said a spokesman for the Department for Education. Head teachers' leader Brian Lightman said: "Most schools choose to follow the local authority calendar because they know that it's better for parents who have children in different schools and teachers who want their holidays to coincide with their children's. "The problem will come if no one is responsible for creating a co-ordinated calendar for an area and it turns into a free for all. "Somebody needs to take the lead locally on deciding term dates and it makes sense for this to be the local authority, even if schools aren't required by law to follow it," said Mr Lightman, general secretary of the Association of School and College Leaders. Stephen Twigg, shadow education secretary, said: "Labour announced this very policy two weeks ago. While I'm glad Michael Gove has finally done something sensible and has picked up on one of our ideas he needs to go much further to reverse his plans which are letting down our children."